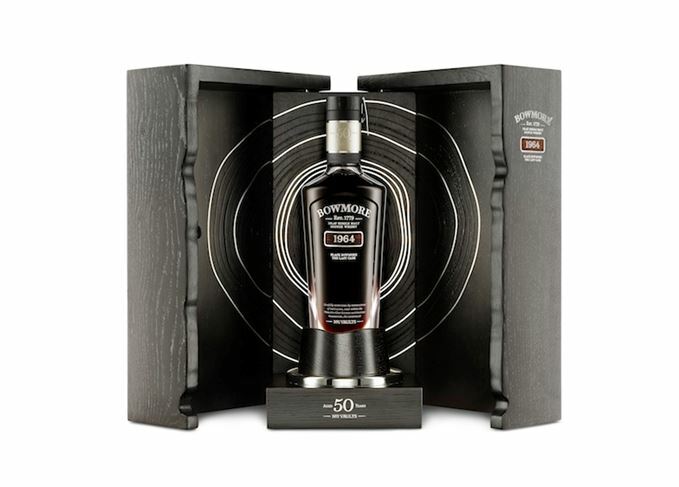 Islay distillery Bowmore has launched Black Bowmore 50 Year Old, the fifth and final release of its pioneering series of collectible luxury single malt whiskies, priced at £16,000 a bottle. Matured entirely in first fill Sherry casks, the 40.9% abv whisky was filled on 5 November 1964 and has lain in the distillery’s No 1 Vault for its entire life. Seen now as a game-changing whisky which ushered in the era of luxury single malt, the first release of Black Bowmore came in 1994. After the fourth release in 2007, the remaining two oloroso Sherry hogsheads were vatted together and returned to the vault, where – after some was bottled as a 38-year-old – they continued to mature, apparently forgotten. In 2014, the whisky was ‘rediscovered’ and removed. The 159 hand-made bottles used for the fifth release were created using traditional glass-blowing techniques by Tain-based Glasstorm Studios. The presentation case, made from Scottish oak with silver inlays representing the five releases as growth rings of a tree, was designed and made by Glasgow-based cabinetmaker John Galvin Design. Black Bowmore 50 Year Old’s Hallowe’en launch event also marked the retirement of Bowmore's master distiller Eddie MacAffer, who started work at the distillery in 1966. ‘The young squad of guys like me didn’t pay these casks much attention to start with,’ he said, ‘but over the years we became aware there were a few “visitors” to them. We followed them and discovered what they were at. They were always class casks. The evening also saw the launch of Bowmore Vault Edit1oN, the first in a four-part series of small-batch releases highlighting key flavour characteristics of the distillery, which will appear on a yearly basis until 2019. The first, ‘Atlantic Sea Salt’, focuses on Bowmore’s marine characteristics, is bottled at 51.5% abv and will retail for about £99. Not one but three Fèis bottlings from Bowmore, including a fervour-inducing Vintage Edition. The 50-year-old whisky was distilled in the year that Bowmore was first bottled as a single malt. Whisky pricing: how much is too much? Three recent releases prompt thoughts on the quest for true value in Scotch whisky.